Whenever I visit my best friend Megan in Kansas City, we always find tons to do. Whether it's going swimming in her apartment pool, shopping at the plaza, or sitting down with a box of Whoppers and a great flick--we always have a great time. Kansas City has a lot to offer as far as shopping and eating. For me, the eating is the best part. Every time I go there we HAVE to go to Pizza Bella. It's a wood fired style pizzaria and I think I have been there the last four times I've gone to KC. The first few times I went there I ordered a classic Margherita style pizza, but last time, I ordered their leek pizza. Can I just tell you? It was so much more than expected. It is covered in leeks and red onions, pancetta, and goat cheese. It is amazing. 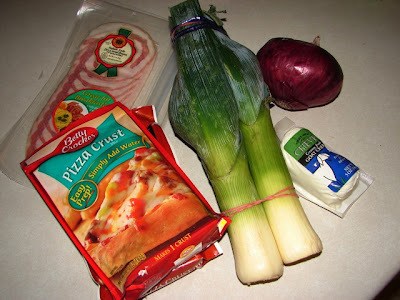 So, now that I'm eight hours away from KC, I had to figure out how to make this pizza on my own. So--here's my interpretation of Pizza Bella's Leek Pizza. 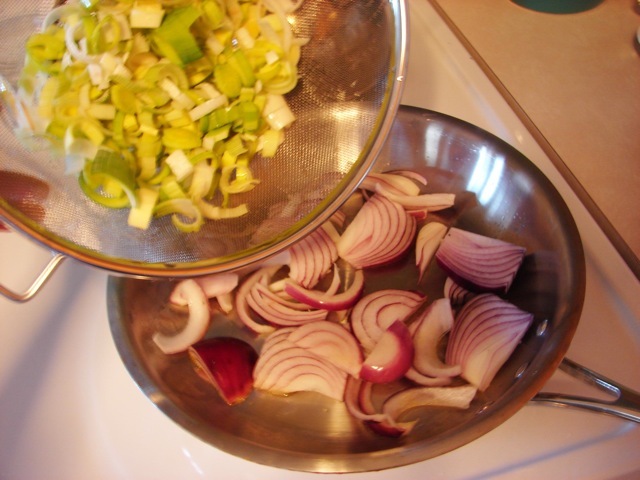 Chop your red onion into half-moon slices and chop and wash your leeks. Add your cubed pancetta. 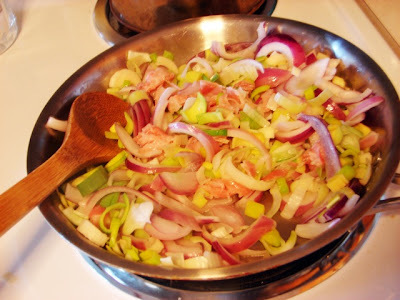 Saute the three ingredients until they are very tender and almost caramelized. Add salt and pepper to taste. You will want quite a bit--we used a lot of veggies! Cover your pizza dough lightly with olive oil and then spread the vegetables on top. 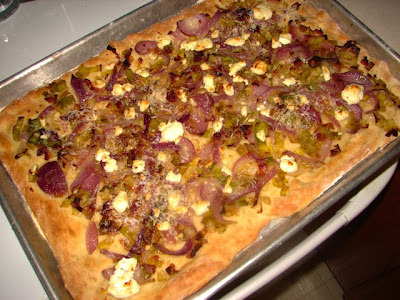 Dollop goat cheese across the pizza and bake at 450 for about 10-15 minutes or until edges brown. Now eat that baby! This pizza is my new go-to meal. We LOVE it. The flavors are like magic.